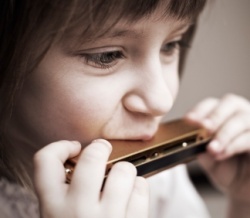 The Toot Suite is available for private tuition and has already coached it’s first Junior National Harmonica Champion (Oct 2011). Lessons can be 1:1 at the Toot Suite, or by Skype. We also offer Saturday morning group sessions in Hove. For group sessions in Schools, please visit our Primary Education page). 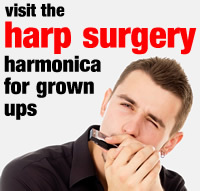 Please note, we teach the diatonic harmonica (short blues style harp), not the chromatic harmonica (button or slide harmonica). If you live in the Brighton & Hove (UK) area, we can offer private lessons to suit. Sessions are lively, fun and tailored to your needs. Lessons can be weekly, fortnightly or on an ad hoc basis and normally last 30 minutes each. We also offer twenty minute or hourly lessons. Each lesson starts with warm-up exercises, followed by work on tunes and closes by writing simple tasks in a homework diary. There is always time for questions, musical appreciation and basic music theory too. Firstly, grown ups are welcome to sit in on one, or all lessons. Your first lesson will involve a few minutes of diagnostic work. Don’t worry, it’s not as scary as it sounds. We just need to see what you can do – even if it’s not much – and talk about what you want to learn. We will then map out key areas for musical development and pick tunes and exercises to help get you there. We normally start on a 4 hole harmonica, progressing to 10 holes as skills take shape. There are a number of techniques to master before progressing to intermediate and advanced levels, such as tone building, scales, trills, octaves and bends. But hard work is always balanced with learning of tunes for enjoyment. If you can commit to ten sessions in advance, we will be happy to offer you a discounted rate and provide you with a Toot Suite voucher (rates below). Individual lessons are booked and paid for in advance by bank transfer, cash or personal cheque payable to R. Steele-Taylor. Occasionally harmonica lessons are treated casually. We therefore have a cancellation policy. All cancellations must be made not less than 48 hours in advance. Failure to do so, or a no-show, will incur the full lesson fee. Toot Suite Director, Richard Taylor, is local representative for the National Harmonica League (NHL), HTAB accredited, CRB certified (enhanced background check) and a member of the Musicians Union (MU). Toot Suite has Child Protection Policy and Generic Risk Assessment available for scrutiny. As a member of the MU, Richard also has third party insurance and legal support. Richard has been playing and performing the diatonic harmonica since the 1980’s, organising workshops, charity events, blues jams and performances at many major live venues. In 1999 he was awarded the title UK National Harmonica Champion.